Young children love to try to feed themselves. 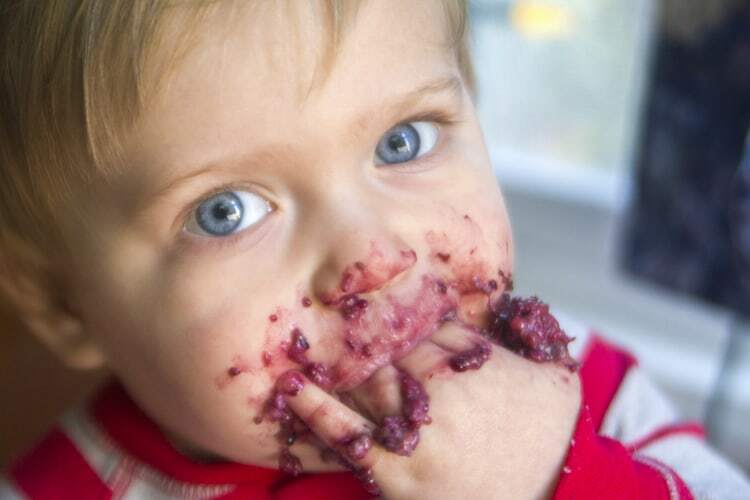 Messy eating and playing with food is a normal part of a child’s development when they are learning to eat independently – and it’s a very important stage for a child. It’s not just because they are learning to feed themselves; they are learning some pretty important skills besides. They’re learning about taste, texture, smell and the temperature of food. They’re learning that a small piece of soft fruit or vegetable is easier to pick up than yoghurt. They’re honing their fine-motor skills and learning how to coordinate and control their movements. They’re exploring the important principle of object permanence. Children aren’t born with the awareness that objects continue to exist when those objects are out of sight. Figuring out what happens to things (food) when they disappear, and learning to anticipate their reappearance, are big cognitive leaps. The not-so-charming problem of food over the edge of the high chair is a small price to pay. They’re learning about gravity: that objects fall down, not up. In this hit-and-miss, messy food eating there’s a lot of learning going on (not to mention the prospect of an exciting new game – having Mum or Dad pick up their food off the floor!). Let’s marvel at the skills our child is learning, and do our best not to turn their food adventures into an exciting new game (the three best strategies are probably to ignore their experiments, calmly pick up the food without fuss, or wait until the meal is over and do just one clean-up). However, if the food is being delivered across the room in an overarm throw by a two-year old, it may be time for a new strategy! Lightbulb Learning Childcare is a brand new Mt Wellington best daycare near Hamlin Hill offering quality care and affordable education for children aged 3 months to 5 years old.